Der Artikel Ludwig van Beethoven (1770-1827): Sämtliche Violinsonaten Vol.3 wurde in den Warenkorb gelegt. 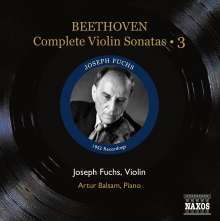 Described by Nathan Milstein as 'the greatest American-trained violinist', Joseph Fuchs had an immensely long career, continuing to give recitals at Carnegie Hall until he was 93. He was a soloist with every major American orchestra and made many important recordings, including the concertos by Hindemith and Vaughan Williams, as well as Mozart's G major and Sinfonia concertante. For many years Fuchs had a duo with the pianist Artur Balsam with whom he made several recordings, including the Beethoven Violin Sonatas of which this disc forms the last of three volumes. Apart from being the first complete cycle on the new vinyl medium, this one set a high standard in quality of both recording and performance. 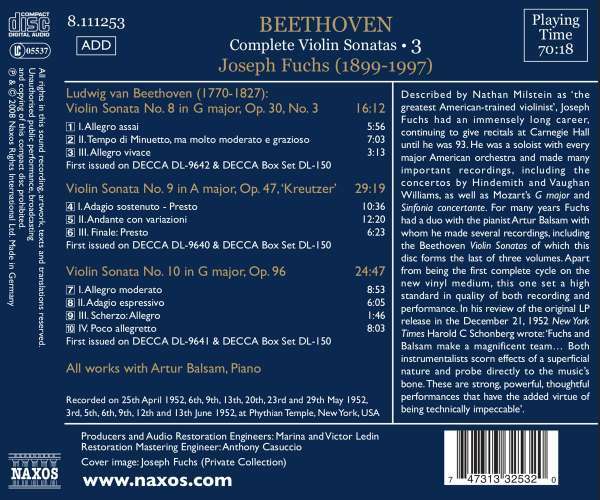 In his review of the original LP release in the December 21, 1952 New York Times Harold C Schonberg wrote:'Fuchs and Balsam make a magnificent team... Both instrumentalists scorn effects of a superficial nature and probe directly to the music's bone. These are strong, powerful, thoughtful performances that have the added virtue of being technically impeccable'.